My meandering journey through the book "1001 Beers You Must Try Before You Die", and other beers. 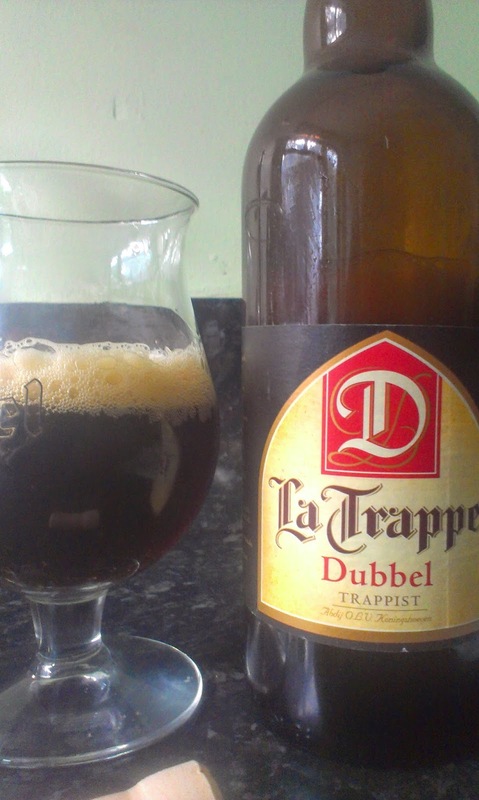 Probably shows may age, but opening the big cork and cage bottle of La Trappe Dubble just brought me back to my childhood and the cartoon trapdoor... anyway enough of this nostalgic revelry and on with the beer. Description: Poured a dark ruby red, maybe even heading towards a mid brown, tan head which went quickly. Aroma is a bit of funky Belgian yeast, earthiness, toffee and candy sugar. Taste is nutty and marzipan (biscuity), something sherbet like, almonds and a dark fruity whack of cherry, plum and dates. Lots of tingly carbonisation. Thoughts: I rather enjoyed this, more so as I worked through the bottle... There are better out there but worth trying if you can get your hands on it. Description: Black with a light brown head. Aroma of roast malt and coffee. Taste is toast, dark malt, light coffee, mineral, and (though it may be psychological) a slightly salty finish. Creamy mouth feel, lots of tight bubbles. Thoughts: Not bad this, decent Irish stout, and the oysters added something this time, preferred it to the flying dog version. 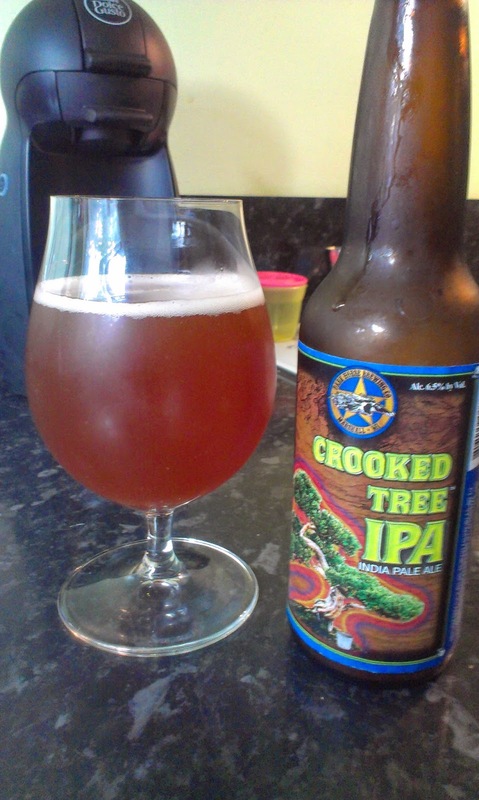 First up was Dark Horse's Crooked Tree IPA (Style: IPA. ABV: 6% From: A very generous colleague!). Burnt orange in colour and proper cloudy. There was briefly a white head but it didn't last from the kitchen to the living room. Lovely aroma: piny; grapefruit; with a hint of caramel malt. Taste follows that; this a big piny citrus number with caramel to balance it out. Decently bitter but not over done. Resin like finish. This was lovely - reminded me a lot of Anderson Valley Hop Ottin IPA - and that's a compliment. Score: 8 .
generous colleague!). Apparently the appearance of this beer means summer has arrived in Michigan & it has a real lawnmower beer quality. Mango, opaque, and again no head. The smell is light; grainy, grassy, reminded me a bit of something like staropramen or kozel. Light orange taste, wheat, and a little spice; I got some pepper too as it warmed up. A fizzy number; light and sinkable. Nice summer beer but nothing outstanding. Paired well with with the cheese and onion mini cheddars I had with it (classy i know...). Right I'm off to watch the world cup but just to flag a couple of upcoming beer events: the last blog highlighted the Beerclubbelfast/brewbot beer dinner and tour; and Lighthouse Wines have now announced their next beer tasting event on 10 July 2014. Porterhouse Oyster was the only one of my 1001 entries that I had to go out and drink before writing. Glad I did too. It's lovely. Yeah, nice stuff all right. Just realised the "not bad" was a bit damned by faint praise but it is good drinkable stuff, and the oysters make a difference unlike others I've tried.